Spirit Airlines stock has soared since its IPO in 2011, but there could be more big gains ahead. Shares of Spirit Airlines (NYSE:SAVE) have soared since the company went public in 2011. Spirit Airlines stock debuted at $12 then, and early investors were enjoying a seven-bagger by late 2014. Spirit Airlines Stock Chart, data by YCharts. Unfortunately, I wasn't one of those early investors. While I've been intrigued by Spirit Airlines stock at various points in the past few years, I've always held off for one reason or another. However, I'm now convinced that Spirit is the real deal, and so I finally made an investment in the company last week. Spirit has steadily expanded its profit margin over the past few years while growing capacity rapidly. As a result, Spirit Airlines stock appears to have plenty of upside left despite its comparatively high price tag. Spirit Airlines has had a profit margin comfortably above the industry average ever since its IPO in 2011. However, since 2012 it has (if anything) widened its margin advantage -- with more gains likely in 2015. 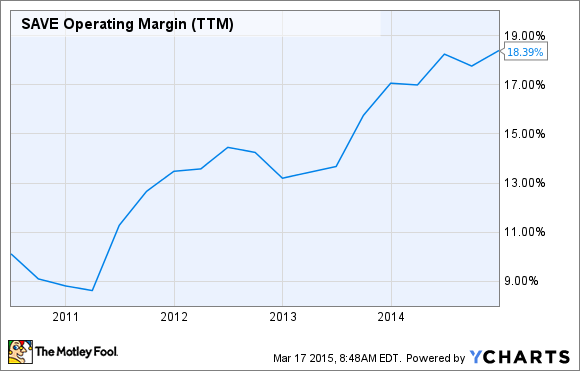 Spirit Airlines Operating Margin (TTM), data by YCharts. In 2012, Spirit's operating margin excluding special items was a very respectable 12.6% (or 14.2%, adjusting for the impact of Hurricane Sandy). In 2013, Spirit increased its operating margin to 17.1%, driving year-over-year earnings growth of more than 70%. In 2014, Spirit's operating margin increased again, this time to 19.2%, contributing to a 33% rise in net income for the full year. Spirit's strong margin expansion between 2012 and 2014 can be attributed to a combination of disciplined cost control, a modest increase in unit revenue, a drop in fuel costs from $3.30 per gallon in 2012 to $2.99 per gallon in 2014, and a nearly 3% improvement in fuel efficiency during that interval. In 2015, Spirit expects margin growth to accelerate dramatically, despite a weakening unit revenue environment. Last month, the company projected that adjusted operating margin will reach 24%-29% this year. This could potentially send Spirit Airlines stock toward the $100 plateau in the next year. The massive drop in oil prices is by far the biggest tailwind. Spirit Airlines is on pace to pay about $2 per gallon for jet fuel in 2015, down more than 30% year over year. Considering that fuel costs accounted for 39% of all operating expenses at Spirit last year, this is an extraordinary turn of events. Spirit also expects non-fuel unit costs to decline by 6%-8% in 2015 due to the company's accelerating growth and the addition of larger airplanes, which have lower costs per seat. Spirit Airlines is well-positioned to continue growing rapidly for the foreseeable future. In 2015, the carrier is adding 15 airplanes to its fleet, driving capacity growth of about 30%. That level of growth isn't sustainable, but Spirit does plan to increase its fleet by another 24 planes in the 2016-2017 period. Furthermore, most of the planes joining Spirit's fleet will be 219-seat A321s. Meanwhile, it is gradually phasing out its 145-seat A319s. The shift toward larger members of the A320 aircraft family will further improve Spirit's industry-leading cost structure. (Unit costs for the A321 are roughly 20% lower than for the A319 in Spirit's configuration.) This in turn will open up new growth opportunities. Spirit Airlines' management has stated that there are more than 500 potential routes that would likely meet the company's margin target. As Spirit's unit costs decline, that list will only grow. Thus, Spirit is positioned to maintain a double digit growth rate well beyond the end of this decade. Surprisingly, Spirit Airlines stock trades for just 15 times projected 2015 earnings. 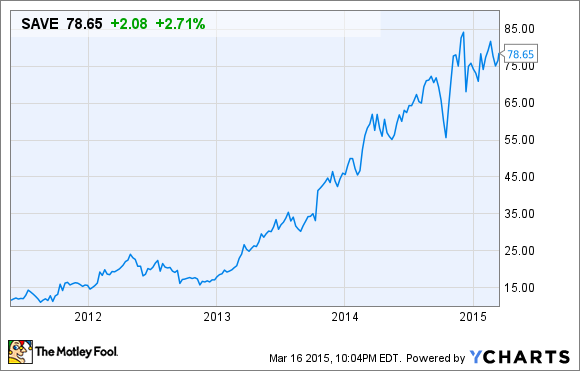 The market seems to be undervaluing Spirit Airlines' growth potential. Spirit Airlines stock trades at a below-average earnings multiple. This doesn't make sense for a company with a consistently high profit margin and return on invested capital -- and the potential to quadruple in size in the next decade. As a result, for investors who are willing to hold their shares for five to 10 years, Spirit Airlines stock still has multibagger potential going forward.